We come from a range of diverse but complementary backgrounds, from campervan hire to coachbuilding and industrial design engineering. We are all campervan buffs who have been shaped by our love of the open road and the freedom of outdoor camping. We know what it means to dream of your own van and all the adventures you will have. We know that special feeling when you’ve pulled up in a remote place without another soul in sight, thrilling at the beauty and magnificence of nature. We’re with you. We get you. And we know how to help you create a campervan that will take you there. Gary set up Campers Scotland in 2006 after a successful career in publishing in London. Starting a new life on a farm, he was on the look-out for a four-wheel drive that could cope with rugged terrain and family camping trips. Gary was introduced to his first campervan, a Mazda Bongo, by a surfer friend in Brighton and immediately fell in love. Then, one weekend he tried to hire a campervan for visiting friends without much luck. Realising that there little choice out there, Campers Scotland was born. Starting off in Tillicoultry, Clackmannanshire, with five Mazda Bongos for hire, he soon expanded the operation to include a range of campervans for sale, including from Mazda Bongos, VWs and Toyotas. Not long afterwards he moved to a larger workshop and showroom in Grangemouth. As a man who loves to get off the beaten track, Gary pioneered Toyota’s first generation of beautifully designed, eco-friendly, fuel-efficient 4WD Hybrid and Tribrid Eco Campers. Driven by passion and a curiosity for innovation and green technology, he has gathered a team of experts to realise his brilliant design ideas. At Eco Campers, Owen’s focus is on the ergonomic design of the van interiors. After a degree in mechanical engineering at Imperial College, London, he began his career designing engines for cars and motorcycles, and worked for a Formula 1 team. 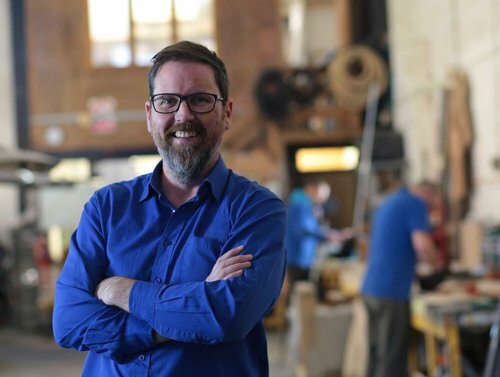 Looking for a broader range of projects that concentrated on user-centred design, he gained a degree in industrial design engineering at London’s Royal College of Art. That was followed by a post as research associate within the vehicle design department, which further enhanced his design skills. 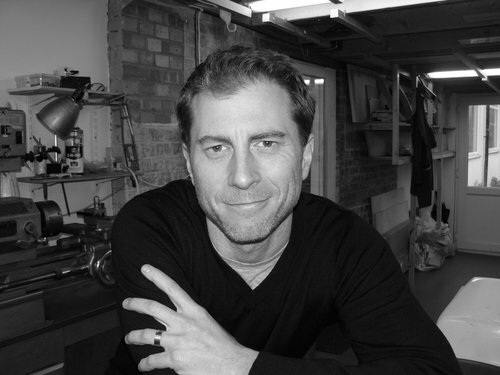 After founding Furnace Design in 2005, Owen worked as a design consultant on a wide range of projects, including commercial vehicles, aircraft interiors, contemporary furniture and automotive power-trains. His life-long passion for sports bikes has taken a back seat over the last few years with the arrival of his daughter, Lana. Scott has been at Eco Campers for three years. After school he served his apprenticeship and worked for Overland Caravans in Larbert, where he specialised in accident damage and refurbishments for coaches, caravans and motorhomes. 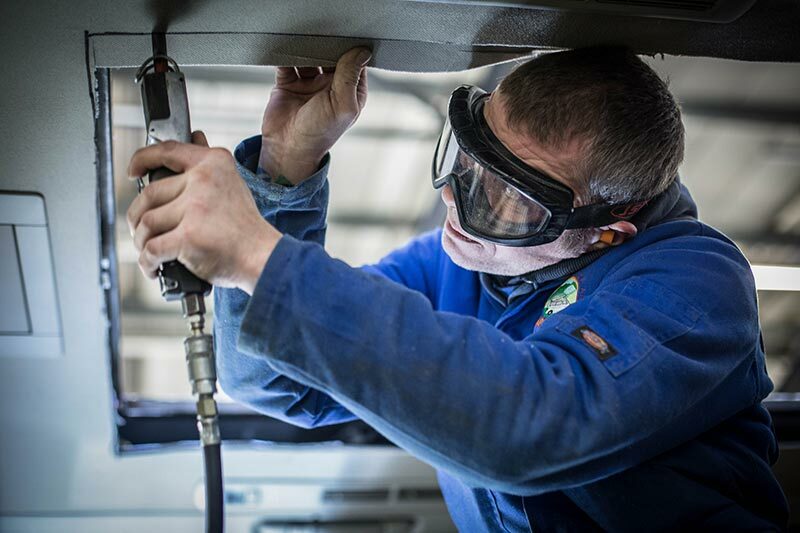 Scott manages the workshop team, and oversees all production, while working directly with customers designing and customising their campervans to their exact specification and needs. He still loves a bit of paint spraying and can turn his hand to all aspects of the job. Scott has two children, and says that his five-year-old son Max is bonkers about campervans and will only go to sleep right away if he gets to sleep in the roof space, because it looks like a tent. His first love is mountain biking and he travels all over the country in campervans, but finds that he can spend half of his time fixing water pipe kinks in winnebagos when he tells other people what he does for a living. A coach-builder by trade, Andy went from school at 16, straight into an apprenticeship with Lothian Buses. He worked on collision damage, refurbishments and learned all the requisite skills of the trade. He then moved to the Right Bus, the UK’s largest designer and manufacturer of the modern coaches for London Buses. Andy has been working with Eco Campers for four years and still loves being let loose on a van and working on all aspects of conversion from the woodwork and metalwork to the mechanics and roof installation. His children, Kyle and Caitlin, are fascinated with campervans and their favourite trip is The Cauldstain Slap in The Pentlands, renowned for a bit of cattle rustling.